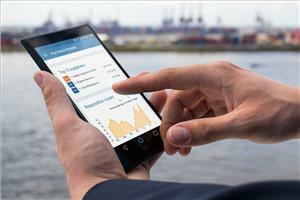 Hanseaticsoft, a provider of maritime software, has launched a new mobile app to make purchasing processes simpler for shipping companies. The new Purchase Mobile app is tailor-made for purchasing executives who are often in meetings or out of the office and enables them to stay on top of all purchasing processes and handle important tasks while on the go. The app gives real-time insights into budgets and operating expenses (OPEX), as well as allowing the user to grant approvals for requisitions and orders even when they are not in the office or have access to a PC. It is the latest addition to Hanseaticsoft's Cloud Purchase module - the first completely cloud-based module for shipping companies that provides users with all the relevant purchasing data regardless of time and location. Alexander Buchmann, Managing Director of Hanseaticsoft, said, "Our new purchasing app gives executives the ability to approve orders on the move, meaning colleagues can continue working, resulting in better transparency, visibility and streamlined workflows. "The app is a valuable addition to our purchasing module; ensuring users have access to relevant information within seconds. For busy purchasing executives this means they can make faster business decisions and collaborate with colleagues wherever they are, which is a huge benefit for companies." The app is available for iOS and Android. It's free for clients using Hanseaticsoft's Cloud Fleet Manager, a platform for companies to manage their entire fleet and for information to be centralised, processed and accessed in real time using apps and mobile devices.